Charles & Ray Eames, 1969 The shape and structure of the Soft Pad Chair is identical to that of the Aluminium Chair. However, stitched leather upholstery renders it softer and more comfortable and makes for an interesting contrast with its slim aluminium profile. 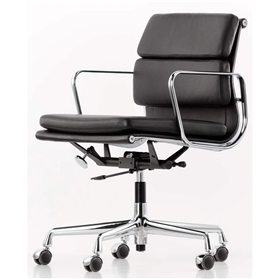 Vitra grants a 30-year guarantee on all chairs of the Soft Pad Group. Mechanism: backwards tilt mechanism can be regulated and set in the forward-most position. Adjustable seat height via pneumatic spring. Backrest and seat: polyurethane foam upholstery with three stitched-on cushions in leather. Side profiles and clamping bracket in polished or chromed die-cast aluminium. Armrests: armrests in polished die-cast aluminium. Base: five-star base in polished or chromed die-cast aluminium. With black castors. With hard castors for carpets and soft castors for hard floors. An Authenticated Eames product.